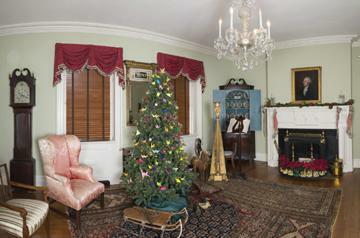 Where can you find Santa Claus, the GOP Elephant, the Tammany Tiger, Uncle Sam, Ulysses S Grant, and a host of other historical and political icons all under one roof? The Thomas Nast Collection at Macculloch Hall Historical Museum. 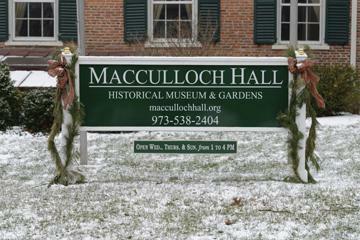 My wife and I were taken on a festive private tour of Macculloch Hall Historical Museum, in Morristown, NJ, this past Christmas season. This gorgeous federal, Georgian style mansion was built by George Perrott Macculloch (1775-1858), the scion of a wealthy Scottish family and a prosperous businessman, who came to New Jersey with his wife, Louisa, in 1810. The historic home has three floors of period rooms meticulously appointed and adorned with a fabulous selection of European and American furniture, decorative art, porcelain (Including an incredible array of White House China), and a famous antique carpet collection from the Middle East and China dating from the sixteenth through the early twentieth centuries. 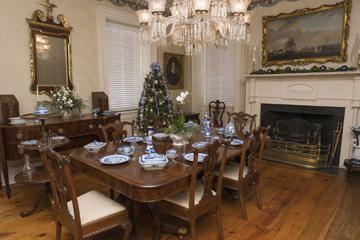 Almost everything at Macculloch Hall, from the primitive kitchen utensils to the opulent chandeliers, were collected by the museum’s founder, W. Parsons Todd (1877-1976), a mining executive, philanthropist, collector, and former two-time Morristown mayor, who established the museum in 1950. Todd was also responsible for assembling the core of the Museum’s most well-known holding – the Thomas Nast Collection, the largest single collection of American political cartoonist Thomas Nast’s original works in the world. Dubbed “the father of American Political Cartoonists,” Nast was one of the country’s most influential and celebrated illustrators. A German immigrant, Nast came to America when he was five years old. Unable to speak English, he struggled in his classes and spent most of his time drawing with the waxy stubs of reject crayons that were given to him by a neighbor who manufactured crayons and candles. Largely uneducated and with limited artistic training, Nast was nonetheless determined to find a job doing the only thing he thought he was good at – drawing. At 15, he landed a job at Frank Leslie’s Illustrated News, but it was his work at Harper’s Illustrated during the Civil War that made him a household name. Nast and his crusading pencil brought readers stirring, heart-felt, and patriotic sketches so persuasive, that Lincoln referred to Nast as his best recruiting sergeant. Capable of bringing down hard-nosed kingpins or turning public opinion against a political candidate with his venomous caricatures, Nast could also tug at the heartstrings of Harper’s readers with his melodramatic engravings of “Columbia” or tear-jerking visions of Emancipation, and none were more endearing than his “annual gift to the readers of Harper’s Weekly,” published each year at Christmas time. 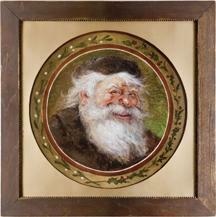 During his tenure at Harper’s Nast produced 76, signed published Christmas engravings including his famous images of Santa Claus. 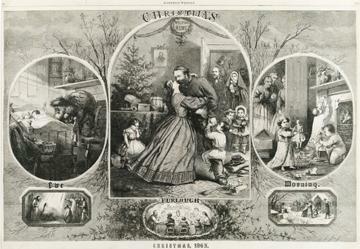 Inspired by Clement Clarke Moore’s poem, “A Visit from St. Nicholas,” more commonly known as “Twas the Night Before Christmas,” Nast’s early engravings stayed true to Moore’s description and thrilled readers with their first look at Santa, his sleigh, and his “eight tiny reindeer.” Over the years, Nast introduced modern twists to Moore’s conception that have endured as part of the Santa Claus story, such as placing St. Nick’s home at the North Pole; giving him a workshop and elves; having children mail letters to Santa; and the dreaded “naughty or nice” list. 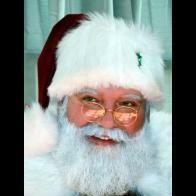 Since 1870, many popular American illustrators such as Norman Rockwell, have sketched out their own visions of Santa Claus but they have all been based on Nast’s original depiction. Yuletide is a tough time for Santas to find the time to visit Macculloch Hall, but for anyone dedicated to the Santa Claus tradition, it’s definitely a pilgrimage worth taking any time of year. The museum is open year-round and Morristown offers a myriad of entertainment options and great dining, including museums, music, Revolutionary War sites like the Jockey Hollow encampment and Washington’s Headquarters, as well as great parks and recreation. If you’re interested, you can find more information at maccullochall.org and morristourism.org.